ACT-R is a cognitive architecture: a theory about how human cognition works. On the exterior, ACT-R looks like a programming language; however, its constructs reflect assumptions about human cognition. These assumptions are based on numerous facts derived from psychology experiments. (more recently) neurological data such as those obtained from FMRI. One important feature of ACT-R that distinguishes it from other theories in the field is that it allows researchers to collect quantitative measures that can be directly compared with the quantitative measures obtained from human participants. neuropsychology, to interpret FMRI data. Some of the most successful applications, the Cognitive Tutors for Mathematics, are used in thousands of schools across the country. Such “Cognitive Tutors” are being used as a platform for research on learning and cognitive modeling as part of the Pittsburgh Science of Learning Center. A detailed introduction to ACT-R is offered in the ACT-R tutorials. Here we present only the very basic mechanism. perceptual-motor modules, which take care of the interface with the real world (i.e., with a simulation of the real world), The most well-developed perceptual-motor modules in ACT-R are the visual and the manual modules. procedural memory, made of productions. Productions represent knowledge about how we do things: for instance, knowledge about how to type the letter “Q” on a keyboard, about how to drive, or about how to perform addition. ACT-R accesses its modules (except for the procedural-memory module) through buffers. For each module, a dedicated buffer serves as the interface with that module. The contents of the buffers at a given moment in time represents the state of ACT-R at that moment. The pattern matcher searches for a production that matches the current state of the buffers. Only one such production can be executed at a given moment. That production, when executed, can modify the buffers and thus change the state of the system. Thus, in ACT-R cognition unfolds as a succession of production firings. ACT-R is a hybrid cognitive architecture. Its symbolic structure is a production system; the subsymbolic structure is represented by a set of massively parallel processes that can be summarized by a number of mathematical equations. The subsymbolic equations control many of the symbolic processes. For instance, if several productions match the state of the buffers, a subsymbolic utility equation estimates the relative cost and benefit associated with each production and decides to select for execution the production with the highest utility. Similarly, whether (or how fast) a fact can be retrieved from declarative memory depends on subsymbolic retrieval equations, which take into account the context and the history of usage of that fact. Subsymbolic mechanisms are also responsible for most learning processes in ACT-R.
“An Integrated Theory of the Mind” (2004). “How Can the Human Mind Occur in the Physical Universe?” (2007). 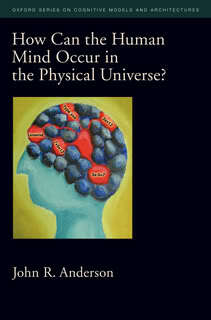 Oxford University Press website for "How Can the Human Mind Occur in the Physical Universe?" Allen Newell describes cognitive architectures as the way to answer one of the ultimate scientific questions: “How can the human mind occur in the physical universe?"